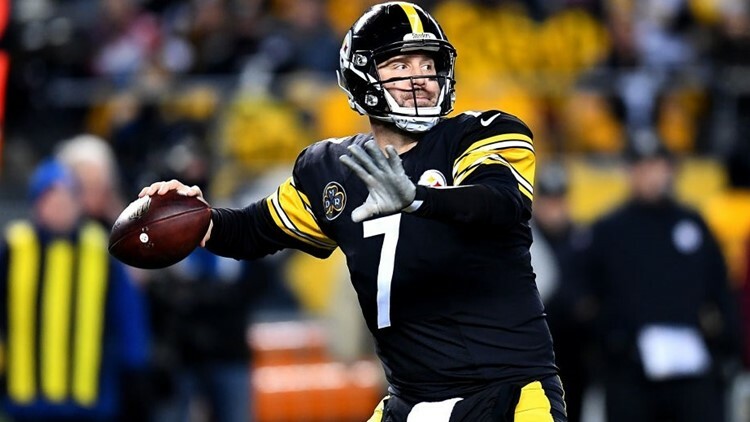 Charting his last 12 November/December home games, Ben Roethlisberger has averaged 351 yards passing and 3.1 TDs. This annual piece, bearing the name of the above headline, was largely inspired by the fake book, Quantum Physics For Dummies. Now, I'm not saying mastering the principles of quantum physics and brokering creative trades for the fantasy playoffs are similar occupations, requiring the same skill set. However, when talking to my 90-something grandmother a few years ago (or even 30-something wife), I might have had greater luck explaining the molecular structure of the universe ... compared to extolling the benefits of a 4-for-2 blockbuster deal in a PPR setting, within a dynasty league that allows trading future draft picks. Enjoy ... and Happy Thanksgiving! Charting his last 12 November/December home games, Roethlisberger owns insane averages of 351 yards passing and 3.1 touchdowns. The message here: Do whatever's necessary to acquire Big Ben over the next 36 hours. "What would it take to get Michael Thomas from your roster?" 2. Never negotiate trade terms over cold and impersonal emails. Grab a phone and physically call the other owner. Or at the very least, open a free and constant stream of real-time exchanges, via text or Internet Messaging. 3. There's nothing wrong with making mutually beneficial trades with an owner who's also a personal friend. 4. ALWAYS be willing to sacrifice talent on the bench for a proven star. A great fantasy shaman once said, "Bench points serve no purpose during the playoffs ... unless you're in a mindless league which counts bench points in tiebreaker situations." In that case, make sure to have the maximum number of quarterbacks on the roster. The mindset here: If you have four productive starters at running back, but only three max starting spots for this position, then get creative with 2-for-1 or 3-for-1 trades–anything that'll help maximize the starting core's potential. 5. Actively seek out the owner who cannot afford to be in Bye Hell this week, while their precious Rams and Chiefs playmakers are sidelined for the weekend. I quote 11Alive's Wes Blankenship from earlier Tuesday: "Man, what a crappy time to own Kareem Hunt (bye) and Kerryon Johnson (injury)." With 12-, 14- or 16-team leagues which start only one passer, there is no plausible excuse for having a two-fer combination of Patrick Mahomes, Jared Goff, Drew Brees, Cam Newton, Tom Brady or Aaron Rodgers during the playoffs. The rationale: No matter who you choose from one week to the next, you’re just wasting valuable points on the bench for that particular Sunday/Monday–especially when another viable playoff or championship contender has a pressing need at quarterback. Maximize your points at the core starting slots! Ever hear of a "1-4 vs. 2-3" trade? This setup rewards owners who have a healthy respect for one another, and frankly, don’t possess much time to dicker and deal. Simply put, this involves a 2-for-2 swap where Owner A gives up the best (#1) and worst player (#4), while Owner B surrenders the second- and third-best players of a deal (#2, #3). In real terms, say I wanted to ship QB Mitchell Trubisky (2,469 yards passing, 23 total TDs in 10 games) to a friend with solid depth at receiver. We’d simply give him/her one premium quarterback (Trubisky has posted top-3 numbers four times this season) and one top-20 wideout (Emmanuel Sanders or Julian Edelman) for one premium receiver (DeAndre Hopkins, Davante Adams) and one rock-solid QB2 in fantasy circles, like Matthew Stafford, Russell Wilson, Philip Rivers or Kirk Cousins. The result: A win-win trade for both parties, satisfying one weakness apiece and replenishing other positions on the back end. 1. Don't sugarcoat your roster weaknesses. If your RB2 has been struggling of late, or has a shaky playoff schedule, use the great bench depth at other spots to maximize the search for a better RB2. 2. Don't move heaven and earth for a wide receiver outside the top 25-ish in targets, dating back to Week 7. We're looking for bedrock consistency at this position during the playoffs ... not wild swings of 30 points one Sunday and four the next. 3. Don't trade for a running back in a time-share situation, unless it's completing the RB-RB handcuff. **Who would make a great 1-for-1 for Patrick Mahomes? **Which top-10 receiver has the easiest/hardest schedule down the stretch? 2) Which owner desperately needs a victory this week–and cannot afford to be saddled with Chiefs/Rams byes? 3) Is there a reasonable path to blocking a title contender from making a momentum-changing trade? As a free trade advocate, I encourage all owners to get aggressive around Deadline Time, especially if there are certain top-shelf assets languishing on one's bench (aka Browns RB Nick Chubb or Bears WR Anthony Miller). On the flip side, it also pays to be ruthless when there's a championship on the line. a) Perhaps adding a third quarterback in free agency ... as a means of guaranteeing they won't be picked by a QB-hungry squad. b) Outbidding a friend for the most coveted trade piece on the market. Even if it's a defense or kicker.